North Korea worships the Kim Dynasty. Religion takes many forms. Some find various forms desirable, some find them undesirable. This article looks at religion in North Korea, where there is little if anything to find desirable from a Western perspective but much to find undesirable. In North Korea, with an estimated population of 24,457,492 (July 2011 est. ), “government sources say that currently there are about 13.7 million practicing Buddhists. . . .” As with most information coming from the country, these figures are probably unreliable. However, it seems likely that Christianity is not prominent. The North Korean government considers Christianity (especially Protestantism) to be closely connected with the Western world and heavily suppresses it. The facts and figures concerning Christianity published by the DPRK’s government, like those concerning Buddhism , are disputed by almost all foreign observers. Although independent verification is impossible, it is assumed[who?] that there are a large amount of underground Christian groups. Many defectors from North Korea have attested that any form of adherence to the Christian faith, even the mere possessing of a Bible, can be considered a reason for arrest and deportation to a DPRK prison camp. 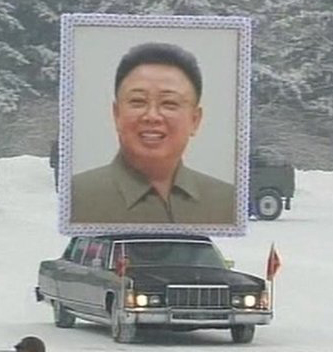 The funeral of Kim Jong-il is one of the vehicles the Kim Regime is using as it has done in the past to ensure its continued supremacy. It is designed to shower with rose petals Kim Jong-un’s path to recognition as the worthy successor to Kim Jong-il as he becomes the new leader, for real or for show. The religious significance of the births and deaths of the Three Kims. Kim il-sung. The one hundredth anniversary of his birth is scheduled to be celebrated widely in North Korea on April 15, 2012. It is to bring a great leap forward to prosperity and power; then, there will be plenty for all, even a daily bowl of soup with meat. His birth seems to have been somewhat unremarkable but his life and death took on mythical auras. He remains the “eternal President” and is also commonly called the Great Leader. official biography says he was “heaven sent,” born in a log cabin in Mount Paektu while his father was fighting the Japanese. “Wishing him to be the lodestar that would brighten the future of Korea, they hailed him as the Bright Star of Mount Paektu,” his biography reads. Lore has it soldiers spread the news of his birth by inscribing the announcement on trees across the country — a practice that North Koreans continue today by carving the leaders’ messages into rocks and mountainsides. According to a report in Pravda, quoted here, he was born in Siberia and the symbolism is a tissue of make believe. Still, it has generally kept the masses in line; few believe differently than they are told to believe by those in authority. He died, according to reports, on the morning of December 17th although it may have been earlier. The accounts of his death were no less mythic than those of his birth. His last public appearance was on an escalator in a Pyongyang supermarket (it appears to be going down, not up — perhaps those who staged the affair didn’t realize the symbolism of going down); now the escalator has been turned into a shrine (video at the link). it is impossible to know how many of the tears shed in North Korea for the late leader are genuine, but people who fled Kim’s harsh rule say that it is partly the result of years of indoctrination. “The North’s brainwashing is so strong that I found myself crying at the news of Kim Jong-Il’s death even though I defected years ago and have publicly said I hate him,” said Lee Hae-Young, director of the Seoul-based Association of North Korean Defectors. Citizens in . . . Pyongyang . . . received a special gift from the recently deceased leader: loads of fish. North Korea’s state-run media reported that Kim was worried about the supply of fish in Pyongyang, and had looked into the matter the day before he died. The North’s official news agency reported that on Sunday Jong-Un sent hot sweet drinks to mourners braving wintry conditions to pay their respects to his late father. As I contended here and expanded upon here, he will most likely be under a regency controlled by members of the Kim family and senior military people; they probably do not accept the thesis that Kim Jong-un bears the mark of divinity. Wailing and clutching at their hearts, tens of thousands of North Koreans lined the snowy streets of Pyongyang on Wednesday as the hearse carrying late leader Kim Jong-il’s body wound its way through the capital for a final farewell. Son and successor Kim Jong-un led the procession, his head bowed against the wind and right arm raised in a salute, from Kumsusan Memorial Palace where his father’s body had lain in state. Top military and party officials, including uncle Jang Song Thaek, were also part of the lead group. As I noted here on December 21st, Jang Song Thaek was Kim Jong-il’s brother in law and Jang’s wife, Kim Kyong Hui, was Kim Jong-il’s sister. She is “the link that ties Jang to the ruling family.” Both are very likely to be important if not lead figures in the regency for Kim Jong-un in which various members of the military will likely join. The funeral was an integral part of the well choreographed performance. [A]nalysts expect largely a re-run of the 1994 obsequies for Kim’s father and founding president Kim Il-Sung — a ceremony designed to pay homage to the late leader and build loyalty to his dynastic successor. Hey! I'm the Boss now. Right? It has not yet been claimed that Kim Jong-un was born of a virgin, although he will doubtless be said to have performed miracles exceeding those attributed to Jesus. Since neither Kim il-Sung nor Kim Jong-il died on a cross, that honor will likely be denied Kim Jong-un. Beyond that, the possibilities are wide open. Perhaps in the future, should there be one for the Kim Regime, it will be written that Kim the father, Kim the Son and Kim the Holy Ghost are in a Stalinist Heaven to which the faithful will be privileged to ascend when they die. Will a Korean Christopher Hitchens (maybe Kimopher Hit-chens?) someday dispute these revelations? We don’t know because we can’t. North Korea is a black hole from which little light escapes. Even when we may have reasonably reliable facts, a rare occurrence, we in the West have insufficient cultural understandings to interpret their meanings. We stumble along on the assumption that people there and elsewhere are little different from us. We can’t do much about radical Islam or the dangers it poses because we don’t understand them. The same is true of the religious aspects which predominate in the Kim Regime. When things we don’t comprehend cause big problems, we react poorly. Some of our universities have departments of Hispanic studies, gay and transgender studies, feminist studies and more. Are there departments of North Korean studies at universities in the United States? I am unaware of even one. We just do whatever we do on the fly, react to crises and forget about being in any useful way proactive because we can’t be. Here is a twenty-four minute video from Aljazeera analyzing the situation following Kim Jong-il’s funeral and speculating about the future. It is well worth watching. This entry was posted in Death of Kim Jong-il, Funeral of Kim Jong-il, History, Hitchens, Kim Dynasty, Kim il-Sung, Kim Jong-il, Kim Jong-un, Korea, Religion and tagged christianity and other religions, western perspective. Bookmark the permalink. Pingback: Opinion Forum » Will the United States Make the Fantasies of a Young North Korean Come True? Pingback: Opinion Forum » Cult of Personality: Who Comes to Mind? Pingback: Opinion Forum » Kim Jong-un Is Really Cool! Here’s a video of the funeral procession. At first, it appears to be a still photo but after thirty seconds or so transforms into a video. Many thanks, Clarissa. I’m excited about it. North Korea says the greatest inheritance the late Kim Jong-il has left the country is its nukes and satellites. In an editorial Wednesday, the state’s official newspaper Rodong Shinmun claimed the country’s launch of satellites and the development of nuclear programs under Kim’s rule have boosted its national status. The newspaper said, that although the country is sandwiched in between the world’s great powers, North Koreans have become a people with dignity and pride thanks to the country’s nuclear power and satellites. Other than the nuclear arsenal and satellites, Rodong Shinmun cited Kim Jong-il’s launch of a new age industrial revolution that has advanced the country’s modernization as the next most valuable inheritance from Kim. Additionally, the newspaper said the North Korean people had inherited a strong willpower to become a powerful nation from the late Kim Jong-il.